The X2, shown, has short overhangs and a coupe-like roofline that makes it look more muscular and sporty than its X1 and X3 siblings. DETROIT -- BMW's new X2 crossover will fill a key gap in the automaker's SUV lineup that accounts for a third of its worldwide sales. 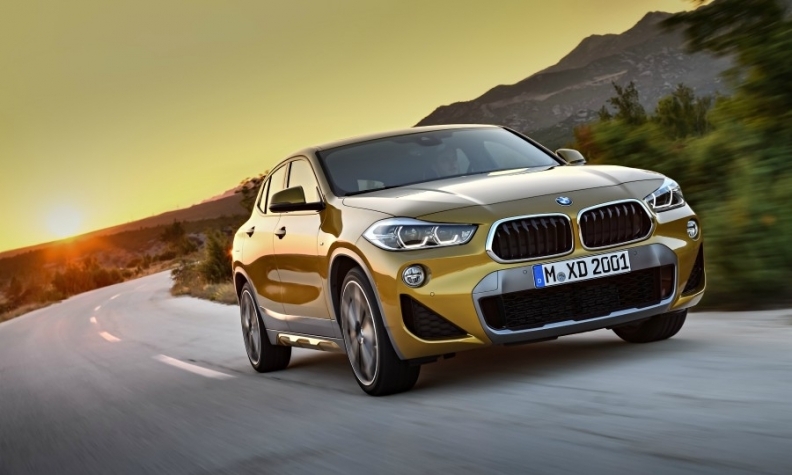 BMW gave the X2's production version a public debut at the Detroit auto show on Monday. The X2 will join BMW's family of X-badged SUVs and crossovers from the X1 up to the full-sized X7 concept, a three-row SUV also on display at the show. The company is positioning the low-slung X2 as the edgier version of the X1. A dynamic video with shots of beautiful young people in the desert and near the ocean accompanied the Detroit unveiling. BMW's North America chief, Bernhard Kuhnt, characterized the X2 as key to continued growth at the brand. The production version remains practically unchanged from the concept version shown in Detroit last year, minus some deft polishing of the interior fit and finish and a general rounding of the exterior corners. Inside the X2 there is seating for five and a host of BMW's crash-avoidance and entertainment technologies. Most notable, however, is its exterior styling, which looks distinct even against the similarly sized X1 and X3. It looks more muscular and sporty than its siblings. The X2 is 81.2mm (3.2 inches) shorter and 71.2mm (2.8 inches) lower than the X1 but has the same wheelbase, with shorter overhangs and a roofline that looks like a coupe. It looks more muscular and sporty than its siblings. A new interpretation of BMW's signature kidney grille, rounded and inverted and framed by angular LED lights on either side complete the sporty look. The X2 will go on sale in global markets including the U.S. and Europe in March. BMW brand sales rose 4.2 percent last year to 2.08 million, helped by a 9.6 percent jump in global demand for X models, BMW said last week.